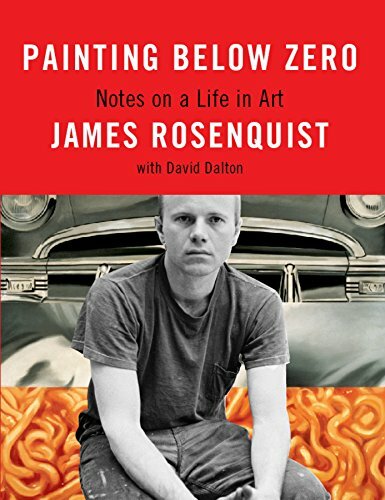 From James Rosenquist, one of our most iconic pop artists&#x2014;along with Andy Warhol, Jim Dine, Claes Oldenburg, and Roy Lichtenstein&#x2014;comes this candid and fascinating memoir. Unlike these artists, Rosenquist often works in three-dimensional forms, with highly dramatic shifts in scale and a far more complex palette, including grisaille and Day-Glo colors. A skilled traditional painter, he avoided the stencils and silk screens of Warhol and Lichtenstein. His vast canvases full of brilliant, surreally juxtaposed images would influence both many of his contemporaries and younger generations, as well as revolutionize twentieth-century painting.<br /><br />Ronsequist writes about growing up in a tight-knit community of Scandinavian farmers in North Dakota and Minnesota in the late 1930s and early 1940s; about his mother, who was not only an amateur painter but, along with his father, a passionate aviator; and about leaving that flat midwestern landscape in 1955 for New York, where he had won a scholarship to the Art Students League. George Grosz, Edwin Dickinson, and Robert Beverly Hale were among his teachers, but his early life was a struggle until he discovered sign painting. He describes days suspended on scaffolding high over Broadway, painting movie or theater billboards, and nights at the Cedar Tavern with Willem de Kooning, Franz Kline, and the poet LeRoi Jones. His first major studio, on Coenties Slip, was in the thick of the new art world. Among his neighbors were Ellsworth Kelly, Robert Indiana, Agnes Martin, and Jack Youngerman, and his mentors Robert Rauschenberg and Jasper Johns.<br /><br />Rosenquist writes about his shows with the dealers Richard Bellamy, Ileana Sonnabend, and Leo Castelli, and about colorful collectors like Robert and Ethel Scull. We learn about the 1971 car crash that left his wife and son in a coma and his own life and work in shambles, his lobbying&#x2014;along with Rauschenberg&#x2014;for artists&#x2019; rights in Washington D.C., and how he got his work back on track.<br /><br />With his distinct voice, Roseqnuist writes about the ideas behind some of his major paintings, from the startling revelation that led to his first pop painting, <i>Zone, </i>to his masterpiece, <i>F-III,</i> a stunning critique of war and consumerism, to the cosmic reverie of <i>Star Thief.<br /><br /></i>This is James Rosenquist&#x2019;s story in his own words&#x2014;captivating and unexpected, a unique look inside the contemporary art world in the company of one of its most important painters. James Rosenquist has had more than fifteen retrospectives, with two at the Whitney Museum of American Art and four at the Guggenheim Museum. He also has had many gallery and museum exhibitions, both in the United States and abroad. He divides his time between Florida and New York, where he lives with his wife and daughter.<br /><br />David Dalton is the author of some fifteen books, including a biography of James Dean and a novel, <i>Been Here and Gone.</i> He lives in upstate New York with his wife, the painter Coco Pekelis.